Futures in Education held their Annual Scholarship Fund Dinner this past Monday, October 24, at the Waldorf Astoria New York, with over 1,000 guests in attendance. The premier fundraising event for the organization and the Diocese of Brooklyn raised a record-breaking $2.4 million to be put toward scholarships that will be awarded to financially disadvantaged students attending Catholic grammar schools and academies in Brooklyn and Queens. Gina Argento, President of Broadway Stages, Guy Chiarello, President of First Data Corporation and Peter Ward, President of the New York Hotel & Motel Trades Council, AFL-CIO, were honored for their tireless efforts and dedication to bettering the lives of children in Brooklyn and Queens. Rosanna Scotto, co-host of Good Day New York, served as Mistress of Ceremonies. Guests were treated to musical performances by student choirs from Our Lady of Trust Catholic Academy in Canarsie, and St. Bernard Catholic Academy in Mill Basin/Bergen Beach, as well as the New York Tenors, who performed the National Anthem and other numbers. 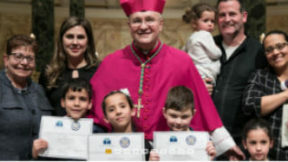 Proceeds from this annual event benefit families in financial need by allowing them to send their children to a Catholic grammar school or academy of their choice in Brooklyn or Queens. Last year, the organization granted over $7 million in scholarships to nearly 5,000 families. Since its inception, Futures in Education has awarded $86 million to over 26,000 students.